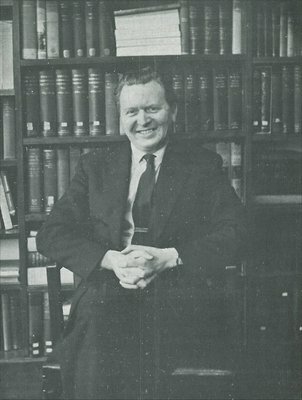 Esmond Wright (1915-2003) was a graduate of the University and Professor of Modern History from 1957 until he resigned to become an MP in 1967. Wright was a graduate of the Universities of Durham and Virginia who served in the Intelligence Corps during the Second World War, rising to the rank of Lieutenant-Colonel. He came to Glasgow in 1946 as a lecturer in History, and was appointed to the Chair eleven years later. Wright was an authority on the history of the American Revolution, but also appeared frequently on television and radio as a political commentator. Among his students were John Smith and Donald Dewar. Angered by the Labour Government's education policies, Wright stood for and won the Glasgow Pollok constituency for the Conservatives at a by-election in 1967 and held the seat until 1970. He was Director of the Institute of US Studies and Professor of American History at the University of London from 1971 to 1983 and Principal of Swinton College from 1972 to 1976. Born 5 November 1915, England.